This article is about the family tree that belonged to John de la Pole, the Earl of Lincoln and what it says about the fate of the so-called Princes in the Tower – Edward V and his young brother Richard of Shrewsbury, Duke of York. It provides an approximate date for the death of Edward V and disproves the idea that either of the Princes might have survived. It also puts the actions of Lincoln, his younger brothers and Margaret of Burgundy in a new perspective. While this new evidence supports the ‘traditional’ view held by most historians that Richard III ordered the killing of his nephews, it also completely revises the narrative provided by the various contemporary chroniclers and Thomas More. It supports a view of Lincoln – and by extension, his uncle Richard III – as ruthless in their attitude to the Princes. It eliminates a number of the alternative ‘suspects’ that have emerged in recent years, while introducing a new one – John de la Pole himself. At the end of this article there will be a link so that the reader may see a video of the digitizing of the manuscript and investigate the content of the roll itself. Who was John de la Pole? John de la Pole was the nephew of Edward IV and Richard III, being the son of their sister Elizabeth (1444 to 1503) and John de la Pole, 2nd Duke of Suffolk (1442 to 1491 or 1492). John was the first-born and was a young adult during the period spanning Edward IV’s death and Lincoln’s death at the Battle of Stoke in 1487. He was made Earl of Lincoln by Edward IV in 1467. He was treated as one of Richard III’s close family. He supported Richard completely during his seizure of the throne in 1483 and benefited greatly from his uncle when he became king. He was Richard’s spare heir and when Edward of Middleham died he became Richard’s heir presumptive. Throughout Richard’s usurpation of the throne between April and July 1483, Lincoln was at his side and supporting him throughout. In an interview for the Nerdalicious web site’s History Salon entitled ‘The Survival of the Princes in the Tower’, four authors discussed the evidence – David Baldwin, Annette Carson, Toni Mount and Josephine Wilkinson have all written about Richard III or the ‘Princes in the Tower’. In the interview, Toni Mount, who is a member of the Research Committee of the Richard III Society, gave Lincoln as an example of a contemporary of the Princes who believed in their survival. We will see from his genealogical roll that she was wrong in that assertion. What is the John de la Pole genealogical roll? In the middle ages most important families would keep family trees and documents in order to be able to prove their descent and as evidence in disputes over inheritance, land and titles. The roll in question is a parchment that has been collected over years and is intended to demonstrate the descent of John de la Pole, Earl of Lincoln from Brutus, mythical ancestor of the kings of Britain. The roll belonged to Lincoln and in addition to providing his family tree it contains an element of propaganda. It will be the Lincoln view of things. The roll is held in the John Rylands Library Special Collection. The library is part of the University of Manchester in England. The existence of the roll is not a new discovery, it has been known to historians for some time. It was mentioned in Hicks’s ‘Richard III’ and in Michael K Jones’s Bosworth 1485: Psychology of a battle. However its most prominent display to the public was in the television documentary Henry VII: Winter King by Thomas Penn shown on BBC 2. It seems that these historians did not look closely at the detail of the roll, because they were using it to make specific points. The roll has been used to demonstrate that Lincoln considered himself to be Richard’s nominated heir after the death of Edward of Middleham, which is stated clearly on the document. 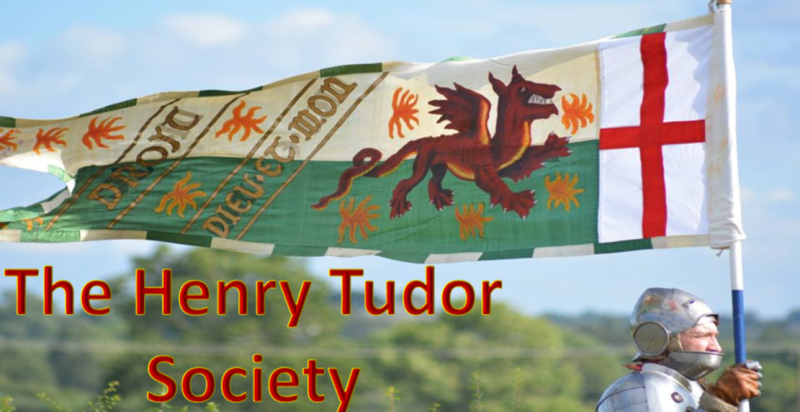 Thomas Penn used it to emphasise how much opposition Henry faced after 1485 and to demonstrate how Lincoln regarded the new Tudor line as an interloper onto the scene of legitimate Yorkist royal blood. The roll does demonstrate this very graphically. The descent of the kings, queens and de la Poles is shown with an explanation of their pedigree and small amount of commentary. It is clearly not Tudor propaganda – for it shows Henry descending from his grandfather, Owen Tudor, a servant. Each individual person in the family tree is represented by a medallion containing a description of the person. The medallions of kings and queens are decorated and include stylized portraits. The lines showing descent are shown in red, however, the invading Tudor line is expressed in thick black. The roll clearly ceased to be worked on at some point in the early days of the reign of Henry VII, since it shows the marriage to Elizabeth of York. Children of their marriage are hinted at by combined red/black lines of descent, but it is difficult to use the children as dating evidence, since the four red/black lines bear no names or commentary. What does the Lincoln Roll say about the Princes? The individual medallions for Edward IV and Elizabeth Woodville show them as king and queen. In the medallions representing Edward V and Richard of York there is no mention of illegitimacy. The boys are shown in every way as though they were children of a valid marriage. Their legitimacy is not questioned in any way or it was of no interest to Lincoln. What is the significance of this information? The period between the death of Edward IV and the Battle of Stoke incorporating Bosworth is one of the most confused and the most written about in English history. This small new piece of information rewrites much of what has gone before, which was the product of chronicles written by persons who were close to the action, but were not sure of what had happened to the Princes. This information comes from a person at the very centre of power, who was at Richard III’s side throughout the usurpation. These writings were put into some kind of narrative by people like Thomas More, who will have used some eye witness reports and his imagination to create a believable story. Later writers, like Alison Weir will have followed the clues provided by More to solve the ‘case’ – concluding that the Princes must have been put to death in September. There have been other documents found that stated that Edward V died in June: Colin Richmond noted that the Anlaby Cartulary stated that he died on 22nd June. The June date also fits in with the documentary evidence of the dismissal of the Princes’ servants and the authorization of their payment shortly after. The representation of Edward V in the roll shows none of the decoration of the other kings and queens and the text does not refer to him as king. It is shown as though Richard III had succeeded Edward IV directly because Edward IV had no heirs still alive. However, it is the use of the word tute – safely that gives the implication of complicity on the part of Lincoln. He viewed the existence of the Princes as a threat and because of the closeness of Lincoln and Richard III it is reasonable to assume Richard felt the same way. If the Princes were dead by the end of June, it makes the appointment of Brackenbury as Constable of the Tower make more sense. He was a man who seems to be of kindly disposition of whom no-one is critical. So gentle Brackenbury would never need to act out of character because there was no longer any dirty work to be done. It also explains why Richard and Lincoln could embark on a royal progress in July with few worries that Edward V could have been freed while they were away. The rescue attempt of July can no longer be misconstrued as an assassination attempt and must be seen on face value as a well intentioned act by people who did not know the truth. Since Sir James Tyrrell’s confession may have been another of More’s inventions, it is possible that attempts to place him at the Tower later in the year are pointless and confusing. Since Lincoln fled to Flanders to raise money to finance the Lambert Simnel rebellion, it is safe to assume that his brothers, who continued to cause trouble for Henry VII throughout his reign, knew the truth about the Princes – as must Margaret of Burgundy. Their complicity would shed a new light on later events. Many Ricardians like to characterize the de la Pole family as unfairly hounded by the Tudors. The implications of this are far reaching and difficult to even summarize in a short article. The above link allows you to see a video about the roll – to see very high quality images click on the link just above the embedded YouTube video. David Durose is a recently retired IT Consultant who has always enjoyed history and became interested in the period after family research established his descent from one of Henry Tudor’s Breton knights. He also borrowed the title for this article from a post on Susan Higginbotham’s Facebook page.